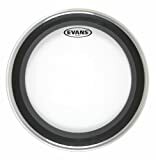 Whether you play rock, blues, country or metal, the Evans EMAD2 Clear Bass Drum Head is a true working drummer’s choice. Named for the externally mounted adjustable damping, the versatile system caters to all bass drum tones by allowing each player to control the attack and focus of the drum head by choosing one of two removable foam damping rings. Choosing the thinner foam ring allows for punch and focus without sacrificing resonance, while choosing the wider foam ring maximizes the low end and attack of any bass drum. The 20” drum head has an outer ply of 6.5mil and an inner ply of 10mil film for added durability. Enhanced with revolutionary Level 360 technology, the clear bass drum head is easier to tune, with a wider tonal range than ever before. Applying the new Level 360 collar shape to the EMAD2 bass drum head allows it to seat itself properly and in turn provides a head that is easy to tune and a sound that is studio ready. Evans EMAD2 clear bass drum heads are available in sizes 18” to 26” with multiple thickness and coating options. For over 60 years, Evans Drumheads has been a pioneer in drum head manufacturing and design. Now part of D’Addario & Company, Inc., Evans products are proudly made in a state-of-the-art manufacturing facility in the USA to the most stringent quality controls in the industry. The D’Addario family’s heart, soul and love for making music is put into every drum and accessory we create, and we never stop inspiring performance. EMAD SYSTEM- The Evans Clear Bass Drum Head has an externally mounted adjustable damping system to control the attack and focus of the drum head by choosing one of two removable foam rings. The 20" drum head has an outer ply of 6.5mil and an inner ply of 10mil film for added durability. LEVEL 360 TECHNOLOGY - A Level 360 collar allows the clear bass drum head to seat itself properly and in turn provides a head that is easier to tune and a wider tonal range for a sound that is studio ready. AVAILABLE IN 5 SIZES - Evans EMAD2 clear bass drum heads are available in sizes 18" to 26" with multiple thickness and coating options. FOR ALL MUSIC GENRES - The EMAD2 bass drum head is extremely versatile for all music genres. A true working drummer's choice, the adjustable damping caters to all bass drum tones. MADE IN THE USA - For over 60 years, Evans has been a pioneer in drum head manufacturing and design. Regarded for high quality and consistency all Evans drumheads are proudly designed, engineered, and manufactured in the USA to the most stringent quality controls in the industry. Interested in the Evans EMAD2 Clear Bass Drum Head, 20” – Externally Mounted Adjustable Damping System Allows Player to Adjust Attack and Focus – 2 Foam Damping Rings for Sound Options - Versatile for All Music Genres? Is the price too high? You can easily price watch this product and we'll notify you when the price reaches your target.